We’d love your help. Let us know what’s wrong with this preview of Doggy Whys? by Lila Prap. Lila Prap returns with another humorously illustrated picture book! Why do dogs do as we tell them? Why do dogs differ so much? Why are some dogs more obedient than others? Why do dogs bark? These questions and many more are answered in this funny fact-filled feast. To ask other readers questions about Doggy Whys?, please sign up. Be the first to ask a question about Doggy Whys? 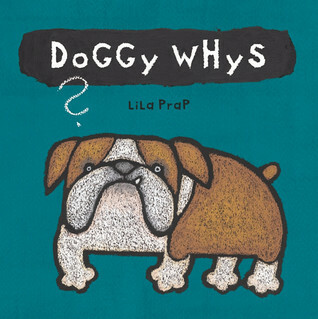 Lila Prap has written another wonderful informational picture book, this time about dogs. Like she often does, Prap begins each double page with a question which she then answers seriously after providing several silly responses. Prap, as always, focuses on information which is great interest to young children and draws illustrations that are just as child-friendly. Dogs bark because they have something to say. A loud, continuous bark warns members of a dog’s family that somethi Lila Prap has written another wonderful informational picture book, this time about dogs. Like she often does, Prap begins each double page with a question which she then answers seriously after providing several silly responses. Prap, as always, focuses on information which is great interest to young children and draws illustrations that are just as child-friendly. If you have ever wondered why dogs bark or why there are so many kinds of dogs or just about any other basic dog question, this is the book for you. Each page answers a different question and highlights a different breed of dog. (There are also cats on each page answering each question in a funny, sarcastic manner.) Illustrations are simple and child-like in execution. Solid information is presented but seems a bit wordy given the simplicity of the style; they don't quite mesh. This book is all about dogs. Which is why I chose the twin text for this to be the book Dogs by Emily Gravet. I chose Dogs because it has illustrations of all kinds of dogs, not information about them because it is a fiction book, just pictures! It also starts each sentence with "I love dogs that..." and goes on to say all of the different things dogs do. I just love dogs so much and I thought that Doggy Whys? was very informative and that Dogs was still informative, just more through pictures! This was probably my favorite read in today's book pile. Well done on multiple levels. Each page features a question about why dogs do certain things, followed up by a few somewhat silly answers but accompanied by an actual answer/fact and then a different dog & dog fact about that breed. Not only was the book informative but also gave me a chuckle. My fourth graders will love this. First graders will love this. Advanced facts for fourth graders. Easier text for first graders. A book about dogs. A bunch of random sentences together??? This book will be a rockin' reading buddies book. I have Lila Prap's original Why? book and her latest adds to the fun of asking questions. Use these books to introduce or continue children's curiosity and asking questions! So much good information about dogs in this one with questions that children are likely to ask. Love these bold illustrations, but this is not a picture books for little kids. Once you open the book, questions about dogs and their habits are asked, with very wordy answers. Cute idea, but wish the text inside was condensed to make it more appealing for younger kids. Gives description of selected breeds. Cute illustrations. Fun format. Answers general questions that kids want to know about dogs such as "Why do dogs do what we tell them? ""Why do dogs sniff each other's bottoms?" Very child-friendly. Great for explaining dog behavior to young readers. Introduces different breeds and explains the why questions about dogs. Very nicely done. Chock full of great info! I found a few typos but other than that this was a very good read!